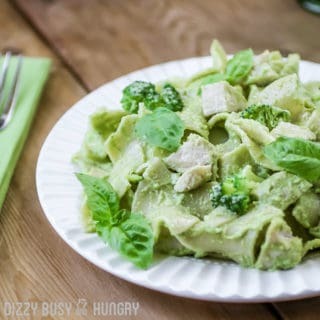 Chicken Pesto Pasta Recipe with Broccoli | Dizzy Busy and Hungry! In this Chicken Pesto Pasta recipe, nutritious broccoli and fragrant basil team up to produce a flavorful, healthy pesto that makes this chicken and pasta recipe a winner! This post was first published January 2014. Last updated December 2018. Is it comfort food, or is it a healthy dinner? This dish is both!! 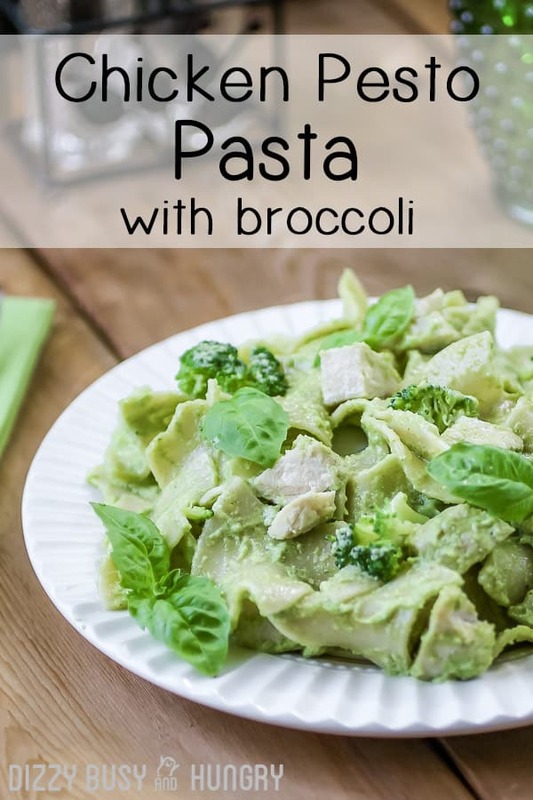 Wide ribbon noodles and creamy, thick pesto make this recipe rich and filling, yet the broccoli, basil, and lean chicken provide lots of nutritional value. If your kids are anything like mine, they love pasta. Various chicken and pasta recipes are among their favorites, without a doubt. They especially love ribbon noodles. I love the wide ribbons because all that surface area makes them great vehicles for getting lots of the yummy, healthy broccoli pesto into my boys! It is a wonderful bonus that Pennsylvania Dutch makes the wide ribbons in a whole grain variety, so that every bite helps my family get some extra fiber, too. For this recipe, I wanted to make something super-wholesome, so I chose broccoli, which is a nutritional powerhouse of a vegetable, and combined it with basil and other ingredients to make a really tasty pesto. In this family, there is no better comfort food than a really delicious creamy pesto pasta! The best part was that the kids did not even realize that the pesto contained broccoli. 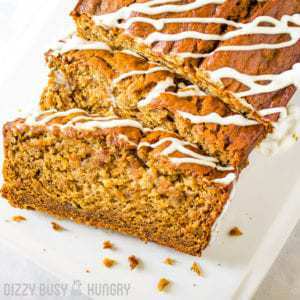 Your family will love this recipe, and you are going to feel so good knowing they are getting all that good nutrition! How do I cook the noodles so they don’t stick together? Make sure you stir the pasta frequently while you are cooking it. After you drain it, toss it right away with some pesto, or a little olive oil if you aren’t ready with the pesto yet. If you are making a different pasta dish, toss it with a little of whatever sauce you are using. Should I rinse the pasta after draining? Do I have to use wide noodles for this recipe? No, you can use whatever pasta you like! Bow-tie pasta would be fun, or rotelle pasta, but even regular ol’ spaghetti will work. My pesto seems a little thin. What do I do? Add a bit more of the non-liquid ingredients for the pesto and pulse until thoroughly combined. It should thicken up. Should I add salt to the water for boiling the pasta? Many people like to do that, and it does make for tastier pasta. However, I often skip that step. So you can choose for yourself if you want to salt the water. If you do, you want to add about 1 tablespoon of salt per 4 quarts of water. Here are some of my family’s favorite pasta recipes! Easy Curry Pasta and Vegetables is not your usual pasta dinner! This is another one of my healthy recipes and uses red curry paste, light coconut milk, and frozen vegetables to create a unique and delicious easy weeknight dinner the whole family will love. If you have kids, you know mac and cheese is always a popular choice. This Slow Cooker Cauliflower Mac and Cheese is easy, cheesy, nutritious, and sure to please even picky eaters! If you are looking for more of a traditional pesto to use in this Chicken Pesto Pasta recipe, you can check out this Classic Pesto Sauce from Bon Appetit. 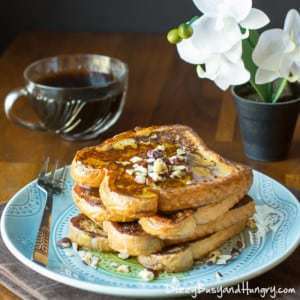 To make this recipe, it might be handy to have these! Note that this recipe fed two adults and two teenage boys, and we had enough leftover for another dinner! So this could actually feed 6-8 people. I calculated the nutritional values assuming 6 servings, however. 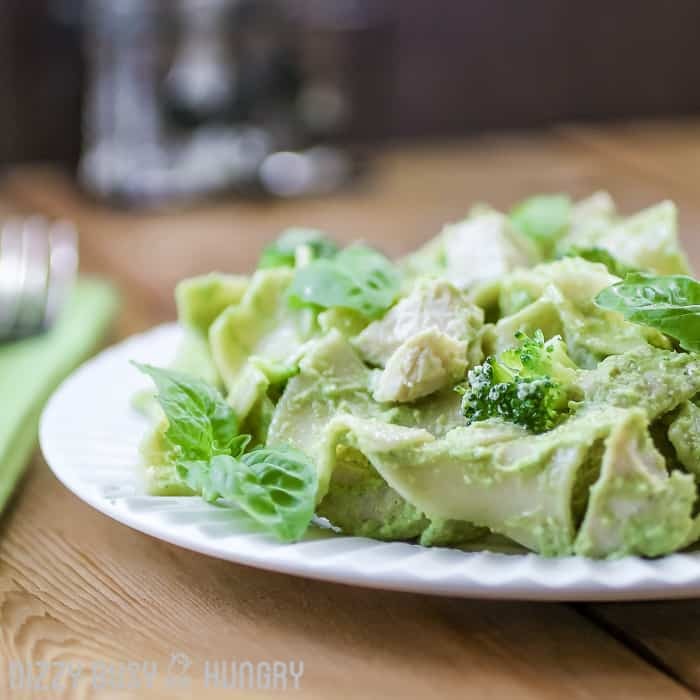 Nutritious broccoli florets and fragrant basil team up to produce a flavorful, healthy pesto which coats the lean chicken and fiber-rich whole wheat Pennsylvania Dutch Ribbons in this dish. Serve with a side salad for quick, easy, and healthy meal the whole family will love! Boil water and cook the noodles according to package instructions. 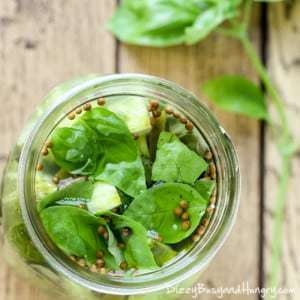 Meanwhile, combine broccoli florets and basil leaves in a food processor or blender, and pulse until the broccoli and basil are chopped very finely. Add the pine nuts to the food processor and continue to pulse until they are also chopped very finely. Add the parmesan cheese, salt, lemon juice, and garlic, and process until well combined. Add the olive oil and process until mixture is smooth. When the noodles are done, drain and return to the pot. Add the pesto and cooked chicken cubes and stir until noodles and chicken are coated. If needed, turn heat on low for a few minutes to keep the mixture warm. Garnish with extra broccoli florets and/or basil leaves (optional) and serve. You don't have to use wide noodles for this recipe, you can actually use whatever pasta you like. If your pesto seems a little thin, add a bit more of the non-liquid ingredients for the pesto, then pulse until smooth. Many people like to add salt to their pasta water, and it does make for tastier pasta. However, I often skip that step, so it is definitely optional. If you would like to add salt, use about 1 tablespoon of salt per 4 quarts of water. Disclosure: Pennsylvania Dutch provided me with a gift card to purchase the ingredients to develop this recipe. Real good combination, pasta, pesto and broccolli. Learning from you.